His name is Karthik. He works as Software Architect in a leading Payroll Company. He has been in this .Net world for past 9 years. He started his career in .Net 1.1. 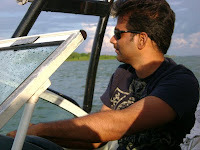 He has worked in all enterprise technologies including Web services to WCF. He has hands on experience in IBM MQ series. MCTS certified. He reads a lot. Favorite authors are Stephen covey, Richard Dawkins, Robin Baker,Stephen Hawkins and Dale Carnegie. He watches lots of Hollywood movies. His favorite movies are Matrix, Shaw shank redemption, Fight Club and all Bond movies. He is interested in taking active part in activities which includes water.